Light provides the energy need for both plant and animal life. The plants will then complete the process of photosynthesis. 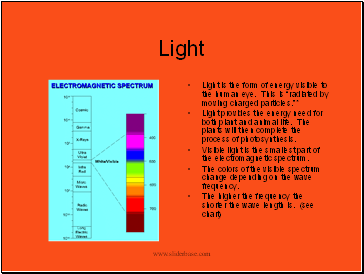 Visible light is the smallest part of the electromagnetic spectrum. 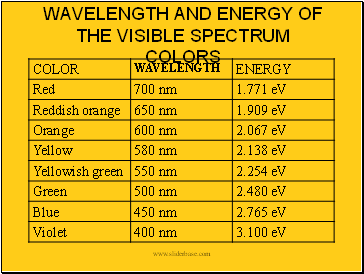 The colors of the visible spectrum change depending on the wave frequency. 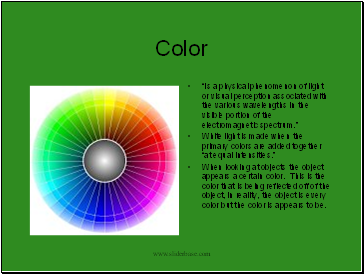 When looking at objects the object appears a certain color. This is the color that is being reflected off of the object, in reality, the object is every color but the color is appears to be. 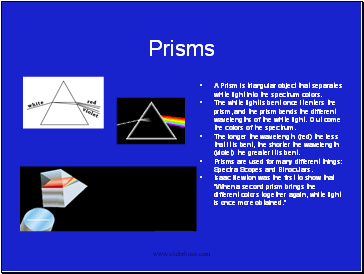 A Prism is triangular object that separates white light into the spectrum colors. The white light is bent once it enters the prism, and the prism bends the different wavelengths of the white light. Out come the colors of the spectrum. The longer the wavelength (red) the less that it is bent, the shorter the wavelength (violet) the greater it is bent. Prisms are used for many different things: Spectra Scopes and Binoculars. Refraction is a phenomenon which occurs with all types of waves in the electromagnetic spectrum, but is most familiar with light waves. In optics, like telescopes, the direction of the light is altered by Snell's law. This law is known as one of the laws of refraction. The other law is when light is being refracted, it changes direction but stays the the same plane. Refraction is what makes it possible for lenses to magnify. The speed at which light travels in vacuum is 187,282 miles per second, it slows only a little bit when traveling through air. Light slows down considerably when it hits a transparent solid or object. Light will not bend when it enters a refractive index. 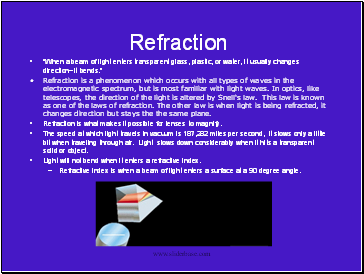 Refractive index is when a beam of light enters a surface at a 90 degree angle.